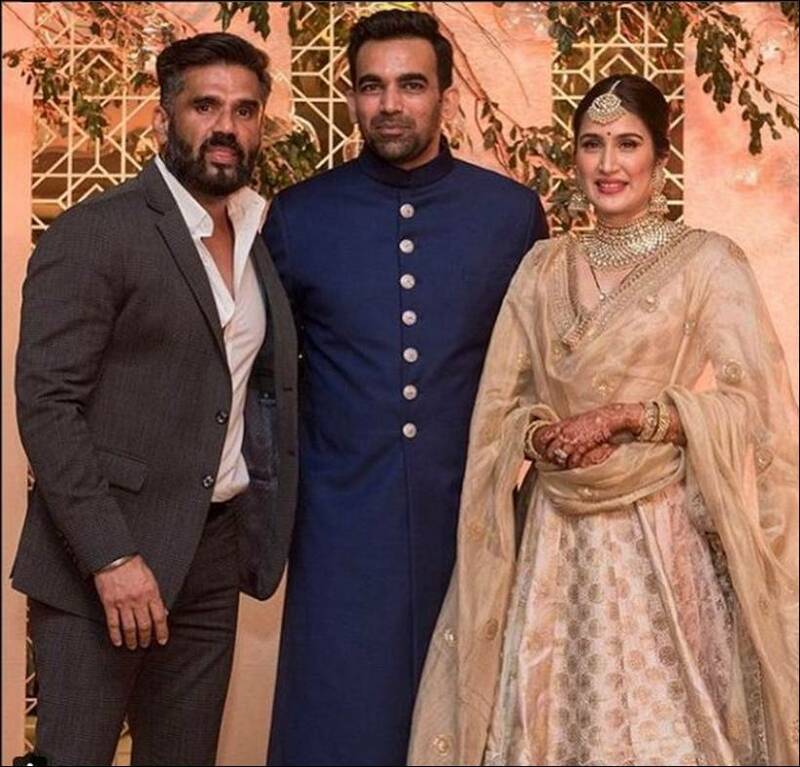 Zaheer Khan and Sagarika Ghatge truly had a wedding to remember. One of our favorite cricketers and our very own Chak De! girl tied the knot on 23 November 2017 in a very private ceremony. 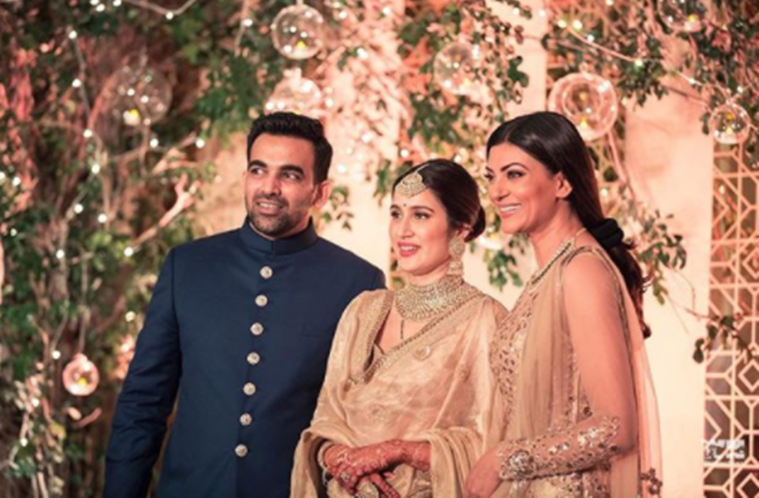 With a low-key wedding but a gorgeous reception, we're here to give you the best wedding Moments from Zaheer and Sagarika's Marriage. 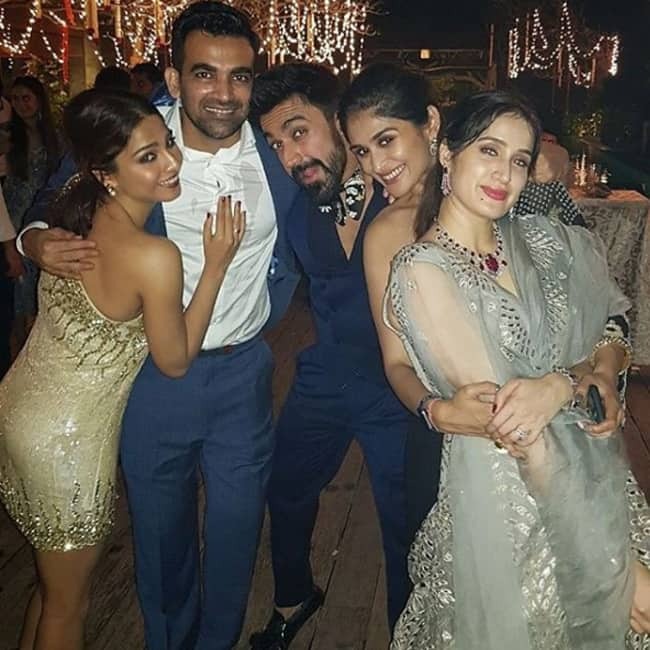 After staying tight-lipped about their relationship for long, Zaheer and Sagarika went public in April 2017 by posting a cute picture on their respective Instagram handles. It all started when he was bowled over by her gorgeous looks and she was mesmerized by his calm yet charming personality. 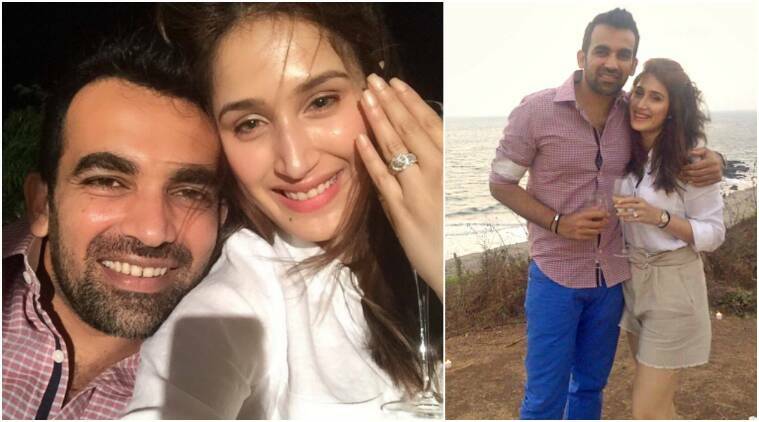 The love story of actress Sagarika Ghatge and cricketer Zaheer Khan is nothing but a fairytale. While marriages of people belonging to different religions are still not a common sight in our country, our celebs are out there setting examples. It is an inter-religion marriage between Sagarika who is a Hindu and Zaheer who belongs to a Muslim family. 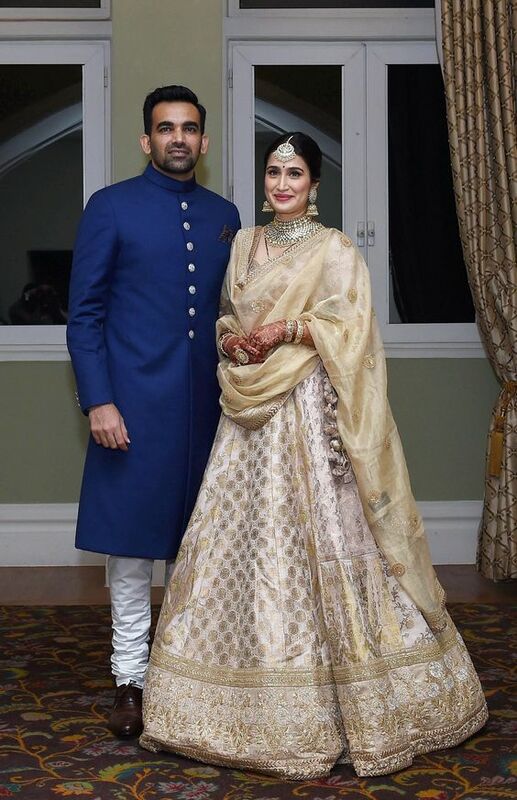 Sagarika and Zaheer said that their parents are open-minded and understand that marriage is not about marrying someone from the same religion but about marrying the right person. The couple decided to ditch the traditional wedding and opted for a court marriage attended by both families and close friends. 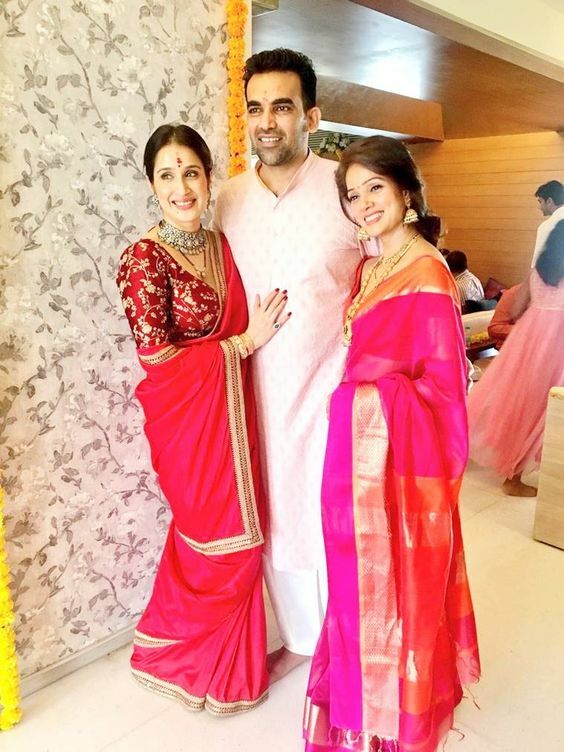 Sagarika looked gorgeous in a red Sabyasachi saree and silver jewelry while Zaheer wore a blush pink kurta for the ceremony. Vidya Malvade, Sagarika's co-star in Chak De India and a family like friend was present at the ceremony. Talking about friends who are like family, Hazel Keech was also there to join the ceremony. Even though the marriage ceremony was private, the duo planned a grand cocktail party and a reception. 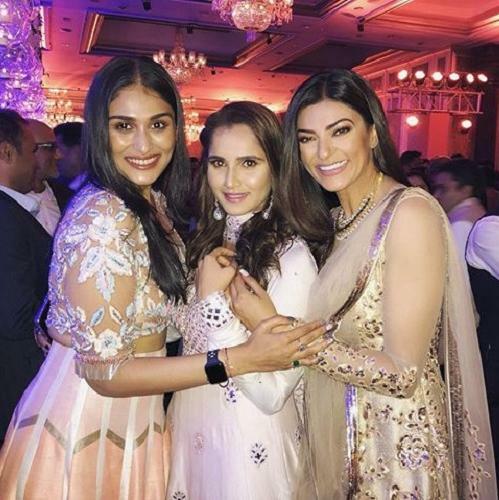 A stunning reception was held for Bollywood celebs and Zaheer's Team India colleagues on November 27 in Mumbai's Taj Mahal Palace, Colaba. 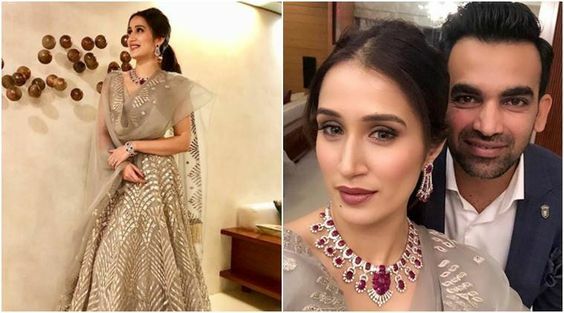 Sagarika wore yet another stunning outfit, a golden Sabyasachi lehenga with chunky earrings and necklace. 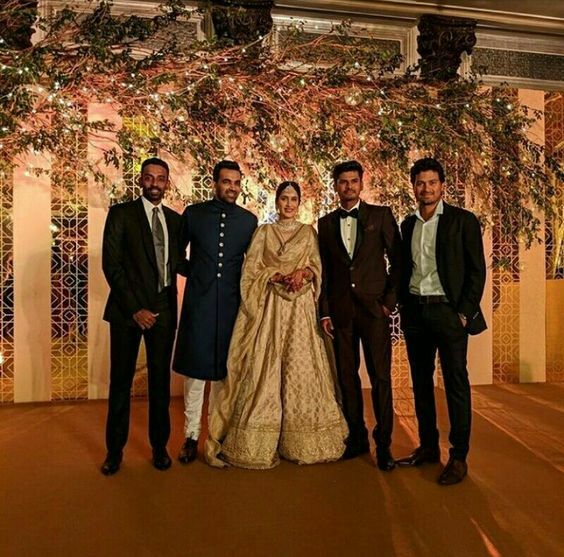 The cricketer wore a royal blue bandhgala and looked extremely handsome next to his bride. Looks like the two big worlds of India – Bollywood and Cricket are suprisingly very compatible. Couples like Harbhajan Singh and Geeta Basra, Hazel Keech and Yuvraj Singh are beautiful examples of this. 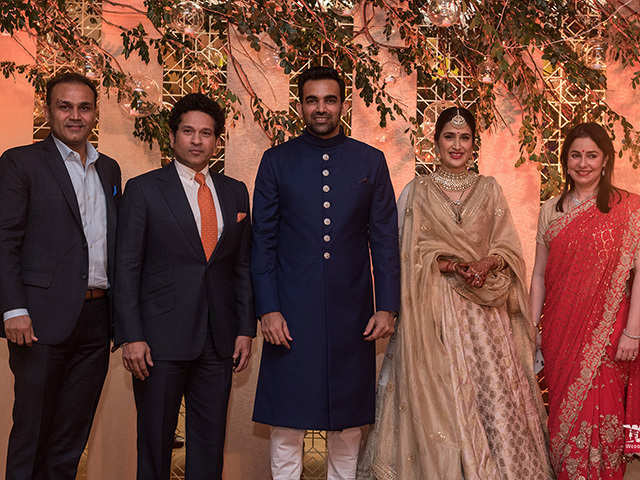 Another addition to this list is dashing the couple Virat Kohli and Anushka Sharma who attended Zaheer and Sagarika's Marriage Reception together. Virat and Anushka were spotted showing some killer moves on the dance floor. The Miss Universe was also in attendance for Zaheer and Sagarika's Marriage and looked like a diva in a golden ensemble. Another Bollywood star to join the celebration was Sunil Shetty, who doesn't seem to age. Mr. Khan took to the stage to thank his guests before cutting the cake, yes! there was cake, with the message of 'Live, Laugh, Love' written on the cake, proving these two are the perfect match for each other. Take a note of how Sagarika hands over the first bite to her dearest hubby. Saniya Mirza at the reception, shining like the star she is even off the court. And everyone seemed to be having a blast, looking like royals. A cricket full house can't be complete without our Viru and our beloved Master Blaster. This Party Isn't Over Yet! The celebrations did not stop at this reception, this party was followed by another dancing night with the couple's friends and family. From everyone looking at their absolute best, let's see how this fiesta went. Sagarika looked enchantingly breath-taking in a lehenga by Falguni and Shane Peacock for the celebration. The muted lehenga was paired with ruby stone jewelry. While Zaheer chose a checkered blue blazer. 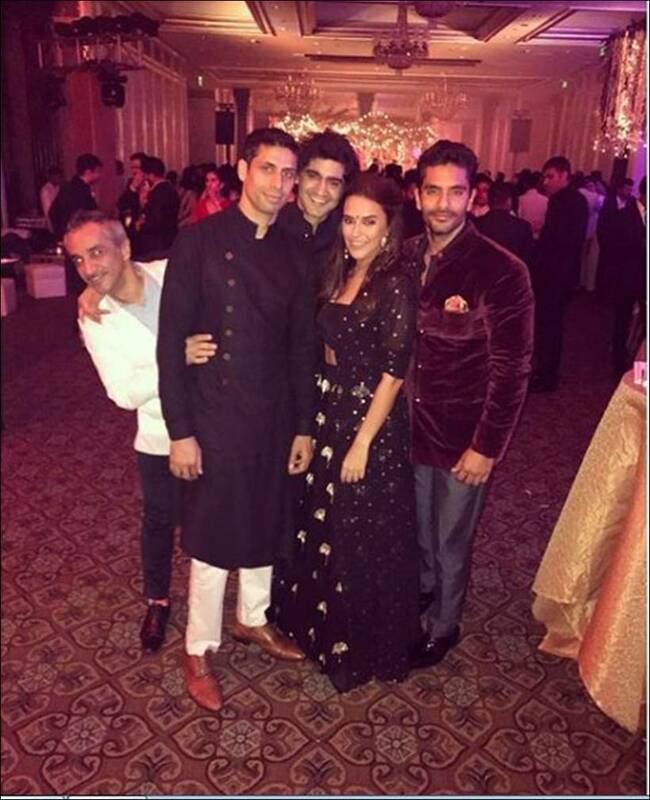 Yuvraj Singh also attended the night with wife Hazel Keech. Keeping is classy, both wore black for the cocktail party. Along with Sania Mirza who looked lovely in an emerald cold-shoulder gown. 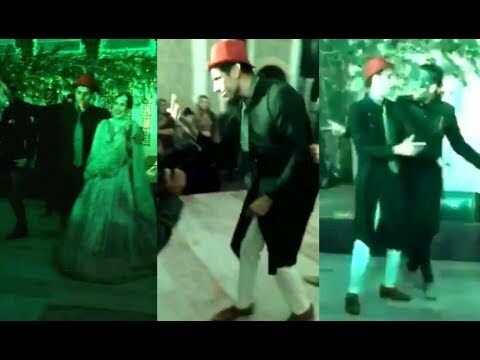 We also caught Ashish Nehra showing off some moves at the party. Even though the images are blur, we can make out that everyone had one hell of a time. 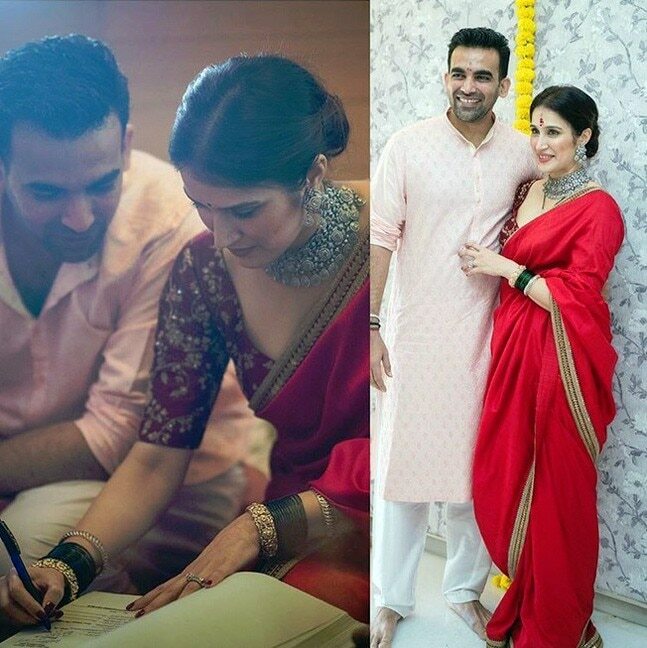 And some more fun moments from Zaheer and Sagarika's Marriage. Doesn't it look like the wedding of the year? 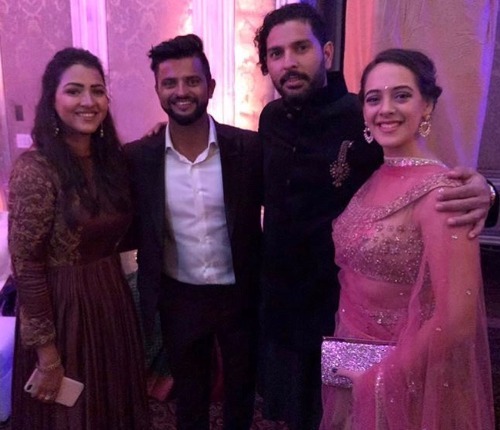 With bang on star power and our handsome cricketers, this wedding celebration will be definitely a cherished memory for the couple as well the guests. And, we at Wedamor, wish the new couple health and love for the rest of their lives.